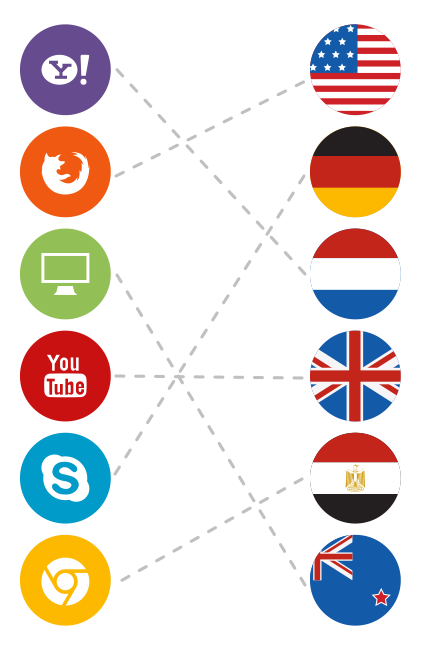 Access your favorite websites in different countries. Be anonymous online to protect your privacy. Encrypts your communications and website traffic for your security and privacy. Seriously faster than other VPN's, with international high speed servers & no data limits. HideAway reinvents and improves the VPN by adding flexible rules, faster speeds and an ‘Always on’ capability, while at the same time giving users a secure connection, privacy and simultaneous access to your favorite sites around the world. Try HideAway for free today. • Protect your data from snooping by your internet service provider. • Access content around the world through an encrypted connection. 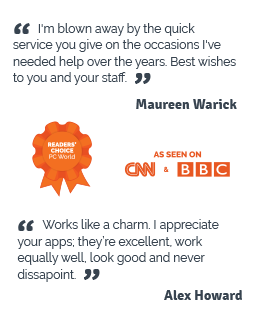 Plus many more, with the flexibility, speed and simplicity you won’t find in standard VPN software. READY FOR THE WORLDS FASTEST VPN? HideAway has been engineered from the ground up to be as fast as possible. In many cases your internet speed will get faster as HideAway has been optimized with many clever techniques to get the most speed out of your connection. 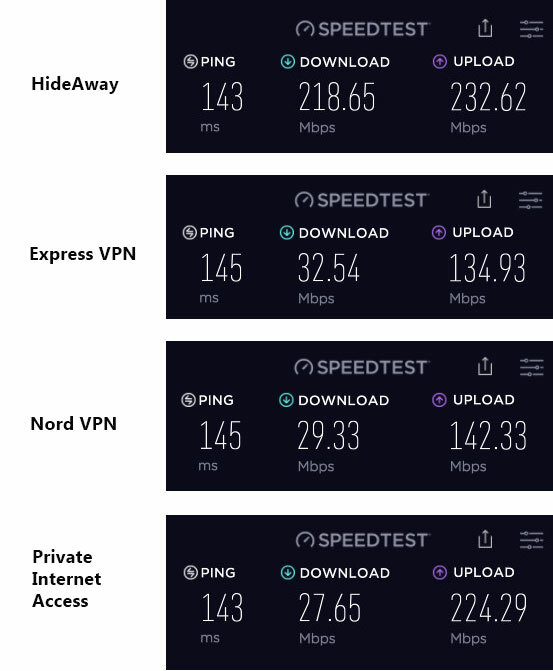 Check out the speed tests on the right - HideAway absolutely blitzes other well known VPN's in speed comparisons. We only use fast servers based on major internet backbones. But we can get away with using cheap cloud servers without seeing any reduction in speed and then pass the cost savings on to you. If other VPN's try and use inexpensive cloud servers, it really shows with a reduction in speed. HideAway uses the same encryption that Google Services use on mobile, so it's been engineered for speed and security. It runs at extremely high speeds and unsures confidentiality, integrity, and authenticity. You can read more info in the FAQ's. Be like a local in any country. Simply turn on ready made rules to access common sites like Youtube, Facebook and many other websites featuring movies, TV, sports, games and music, or add your own! Use HideAway to view local content and prices while away from home, or in other countries. HideAway is the only VPN with flexibility! Tunnel your internet for any applications or websites to different countries simultaneously. For example, you could make Google connect via Germany, Youtube via USA or United Kingdom, then make some of your applications run through another country all without having to switch each time. You have total flexibility to filter your internet traffic where you want it to go to bypass country or corporate restrictions and at the same time, maintain your privacy. You can't do this with other VPN's. Feel like you’re back home when travelling abroad with access to all the local content you’re used to. Your mileage may vary depending on what and where you’re connecting to but you should get faster speeds and lower latency with HideAway. Some users have reported 2 - 10x speed increases due to HideAways ability to get around your internet providers tendency to slow internet traffic at peak times. Other VPN’s will typically slow your internet by around 30%. When we use the internet, most of what we do is unencrypted so it’s easy to spy on what we do online at work, home or in public. HideAway masks your IP address with our anonymous IP addresses and encrypts your internet traffic, so your ISP, Government and hackers will have no idea what you’re doing or what websites you're visiting. The added benefit is that websites and internet services can no longer track you. We didn’t build any logging capability in to the software, so we can't even turn logging on. So we can’t be compelled to hand over any information as we have nothing since the logging capability doesn't exist! When you connect via our high speed servers, you can use as much data as you like - there are no limits. (You still need to pay your own ISP data charges though). Additionally, our servers won’t get bogged down because as an option HideAway logs you in for most bandwidth intensive services like video, then uses your own ISP’s connection to stream the bandwidth intensive content. Your connection is secured with the same super strong AEAD encryption used by Google Services, therefore it’s very fast. Any internet activity you do through HideAway can be encrypted and anonymous. When you access the internet over public wifi - for example, and internet cafe's, your content is secured through HideAway from eavesdroppers who might otherwise use hacking tools to get your information. Turn Encryption On/Off For Some Websites and Applications (Coming soon) Encryption may add a bit of overhead, so your internet connection won’t be as fast with encryption turned on (although we are only talking about a 5% difference with HideAway). So, if you don’t care about encryption for some websites, you can turn encryption off for those websites and applications to get full download speeds. This is awesome. It means HideAway is always on. Unlike a VPN where you have to start it up, wait 10 seconds for it to connect, then shut it down when you’re finished. HideAway is always working, and combined with the flexibility of custom filters to split up your internet traffic and direct it to different countries simultaneously, you never need to turn it off. 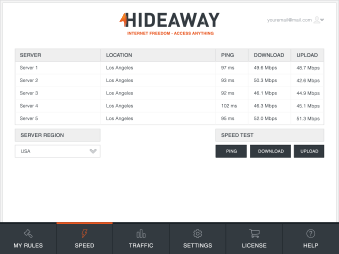 Additionally, unlike a traditional VPN, HideAway automatically roams as you move between internet connections - WiFi/LTE/Ethernet and if you lose your connection, HideAway will resume when your internet does. What is a VPN/encrypted tunnel and why use a it? VPN is a technology to pass network traffic via an encrypted tunnel. 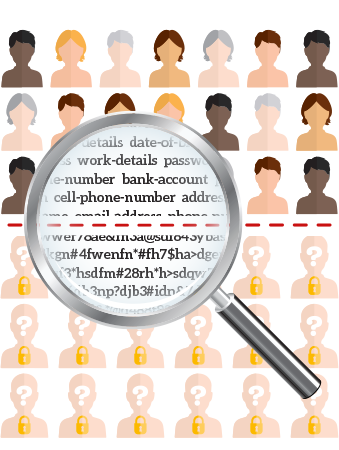 It provides secure access to the internet and guarantees anonymity and privacy. Since it connects you via the secure tunnel to a server located elsewhere, this means you are able to access other websites. This also means it looks like all your internet traffic comes from the country you're connecting through. 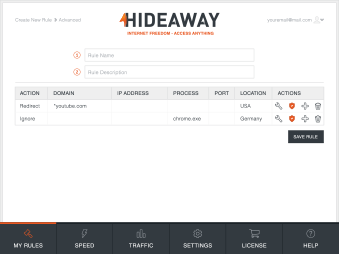 HideAway intercepts your internet traffic and diverts it to different countries according to the rules you have setup. For example, if you live in Greenland and you want to watch Youtube, then when you go to youtube.com it will divert the youtube traffic to USA, likewise if you want to view Facebook in the UK, then that portion of the internet traffic will be diverted to the UK. (Coming soon) HideAway can also be used to divert traffic from applications, like your internet browser or email program, or used to block or ignore traffic too. It's like a flexible filter for your internet traffic, allowing you to divert internet via different countries, ports or IP address for websites and applications. Which countries do you have servers in? We have a limited number of servers during the beta phase. USA Los Angeles, California / Oregon. What makes HideAway different from a VPN? Create rules for ultimate flexibility: (Coming soon) As well as being able to choose preset rules/channels for your favorite content, users can create custom rules to redirect, block or ignore traffic to different countries simultaneously. e.g. Direct all Google Chrome traffic to the UK, except youtube.com connects via the Netherlands, while Facebook.com and the Outlook email application connects via the USA. Connectionless and hassle free: Because HideAway uses rules to redirect portions of a user’s internet traffic, it can always be left running. A regular VPN which needs to start up, take 10 seconds to connect, then the user needs to select a country to connect via, then disconnect after use. HideAway removes this annoyance because the user only sets up the rules they need. Even if you turn your computer off or switch between wifi and ethernet, HideAway will keep on working without interruption. Faster Speeds: HideAway’s connection protocol is optimized for high speed, and combined with dedicated high speed servers you get low latency and faster upload and download speeds. Most users should see faster internet speeds when using HideAway, whereas most VPN’s reduce internet speeds by 30%. 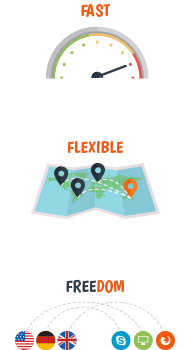 Flexibility and better access: Because HideAway lets users setup rules to tunnel different websites and applications (coming soon) to different countries simultaneously, users doesn’t suffer the inconvenience of some other VPN’s such as having to connect to the service, then disconnect, or websites like Gmail becoming blocked because it thinks the user is in a different country, or printers, security cameras and backup hard drives no longer working because the computer is no longer local. Faster and provably secure encryption: Most encryption slows internet connections down, but HideAway uses dedicated high speed servers with the faster and AEAD encryption so you won’t notice any reduction in speed. What things can I do with HideAway? • Connecting to different countries means you can access the video on demand, sports, movies, games and music in those countries. • (Coming soon) You can create your own custom rules to redirect your internet traffic elsewhere as you choose. • Since you don't lose speed or increase latency with HideAway, it's perfect for games and streaming video. 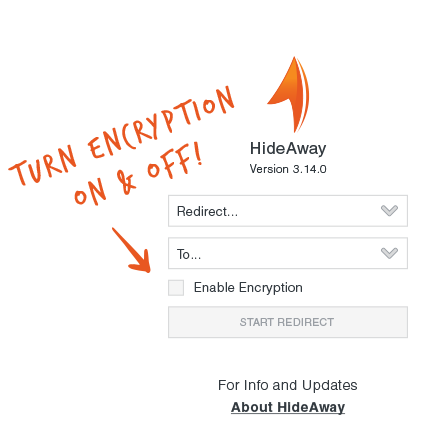 • HideAway masks your IP address and encrypts your internet traffic so you can browse the internet in complete anonymity. • HideAway will keep your wifi connection secure when you're connecting to public wifi spots while using non secure websites and email. Check out the Support Page, or send our friendly support team an email with your question. How do I do an independent speed test? The speed of your internet can be highly variable and depends on the time of day, how many other people are using the connection, the connecting server and other factors. To do a reasonably consistent speed test, load up a browser rule in HideAway like chrome.exe to redirect to one of the servers through Hideaway. Go to www.speedtest.net, and start the test - do it 3 times for consistency. Is there is a list of frequently asked questions? HideAway reinvents and improves the VPN by adding flexible rules, faster speeds and an 'Always on' capability, while at the same time giving users a secure connection, privacy and access to content around the world! The trial is fully featured but periodically pauses activity. License for 1 concurrent user. Includes 1 years use of all new versions, updates and customer support for use with 1 concurrent user.